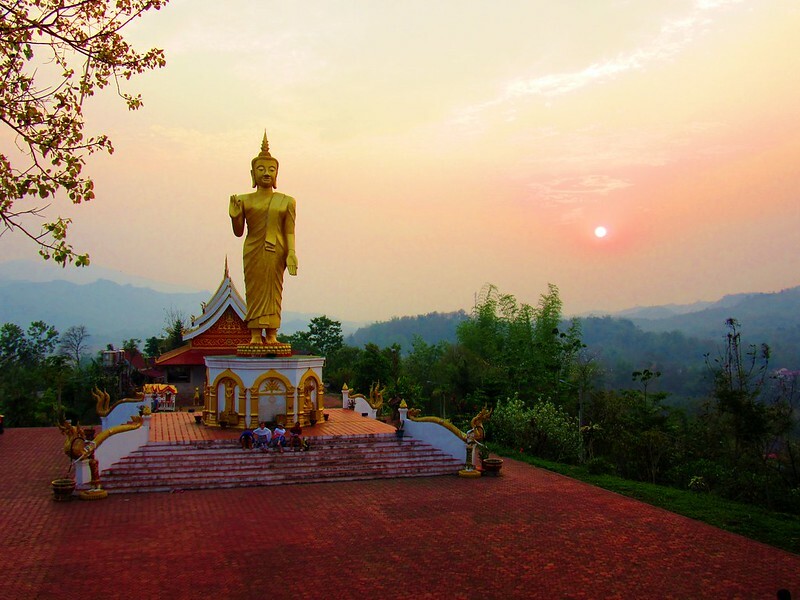 Our guest house turned out to be at the foot of a hill with a big temple and buddha, which was a beautiful spot for the sunset. There were a few decent restaurants in town, although we gravitated towards a place called Kanya’s, as wikitravel mentioned the huge portions. They weren’t kidding, we ordered a dish each and some rice, ending up with way to much food for the two of us. We went a couple more times as the food was so good, but were more restrained with our ordering. Even though we were still in the country for two more days, it would turn out to be our last taste of Lao food. Oudomxay is split into two halves by a river. 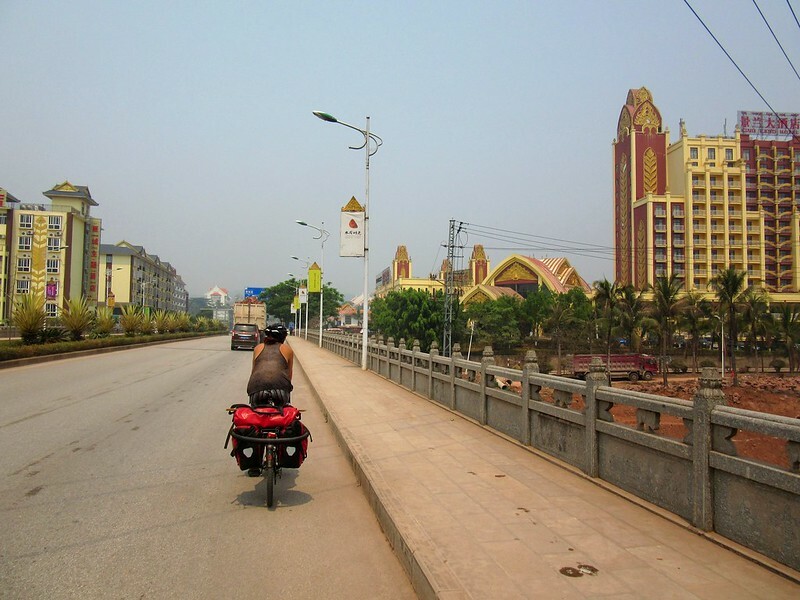 Cycling away through the northern half, almost all of the businesses had Chinese signs outside. From here on, we also started to see more and more Chinese number plates on passing cars and trucks. 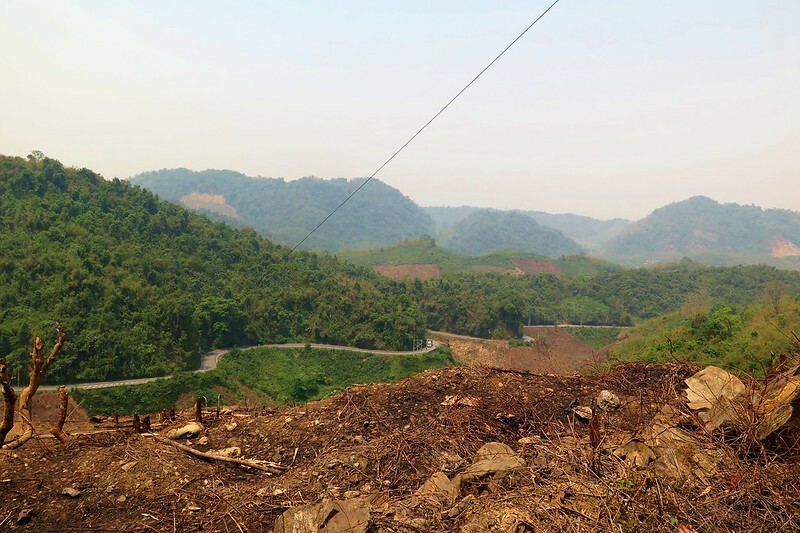 This northern part of Laos has a very large population of Chinese, who own restaurants, shops and hotels, and as we mentioned before, a lot of the new construction on the road has been funded by China. The road towards the border continued to be smooth riding on new concrete. 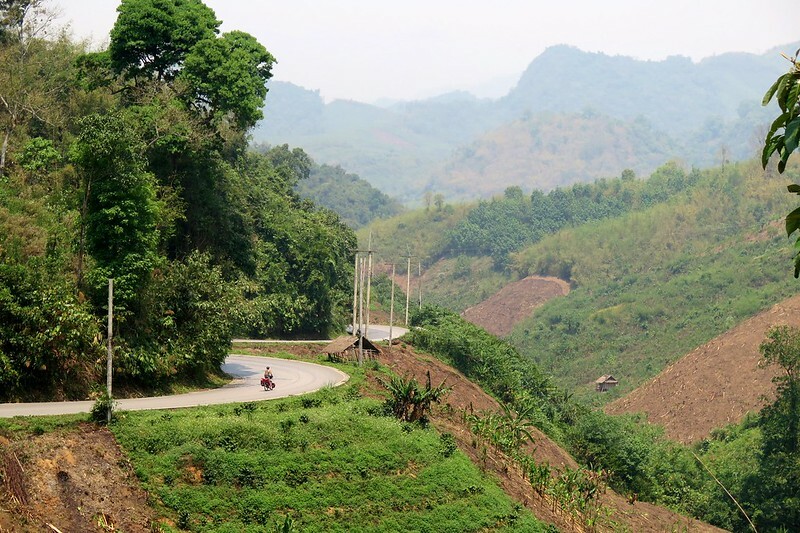 The first 10km was mostly flat, following a river through a winding valley. Then we reached a few switchbacks and the start of a climb which lasted for the next 15km. It really didn’t feel too bad though as the gradient was so gentle. Without too much effort, we were back up to over 1,200m altitude and looking out over lush green mountains with a clear blue sky overhead. After coasting through a few hilltop villages, met with the usual chorus of ‘sabaidee’s we were heading back downhill. The gradient was perfect for cruising at 40 or 50km/h without having to worry about braking too much. The corners in the road stuck to the contours of the hillside, twisting and turning for the next 15km down into the valley, great fun. This brought us out smiling into Namor, a small market town with a couple of places to stay, where we decided to stop for the night. A scowling Chinese woman showed us a room, which we took and then headed out in search of some Lao food. No luck though, the few restaurants in town were Chinese, so we were back to the old charade of picking out ingredients from the fridge and hoping for the best. We did meet a Lao guy called Samson who greeted us in fluent English. 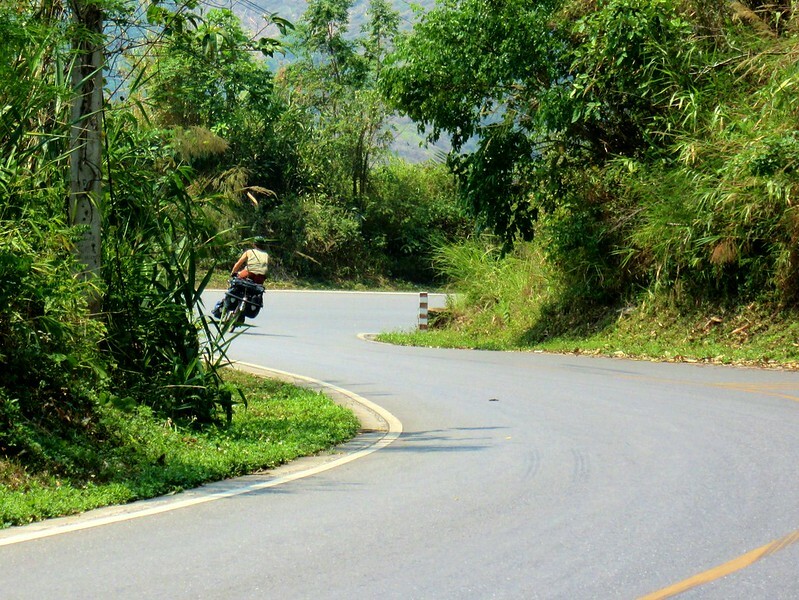 He was from Luang Prabang and was travelling around Northern Laos on his scooter. He could also speak Chinese, Japanese, Thai and several other languages. All of which he’d picked up and mastered by talking to tourists around Luang Prabang. Very impressive. We were woken up in the middle of the night by a few pissed up guys in the hallway outside our room. They were fumbling around and one of them was trying to get into our room, turning the handle and knocking on the door. Luckily it was locked. I hammered on the door from our side, and shouted a few choice English words at them. It must’ve done the trick as they quietened down and disappeared off to their rooms. No language barrier there. Thanks to the broken night’s sleep and the fact we had a short ride ahead, we were out on the road later the next day. 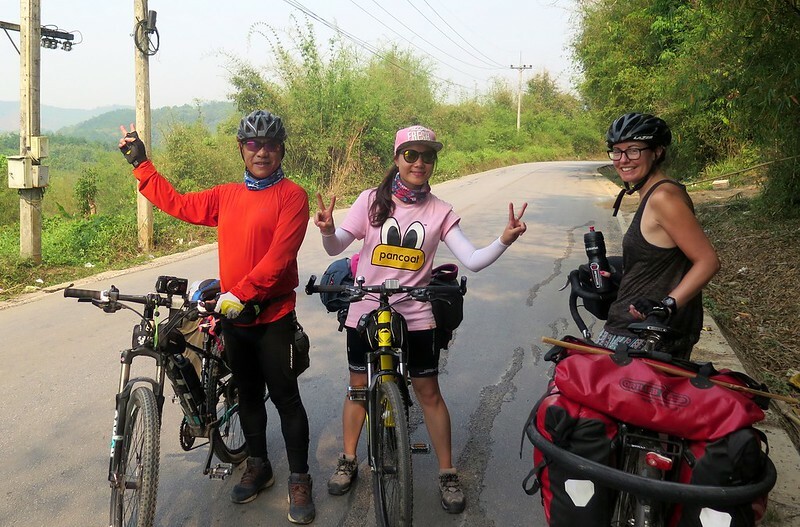 The riding was very easy for the remaining 50km to the border, a few short ups and downs, but by Laos standards, very flat. Around halfway, we met a couple of cyclists touring on mountain bikes coming in the opposite direction. They were a Chinese couple, from Jinghong, one of the larger cities in Southern Yunnan. One of them spoke pretty good English so we chatted for a bit. 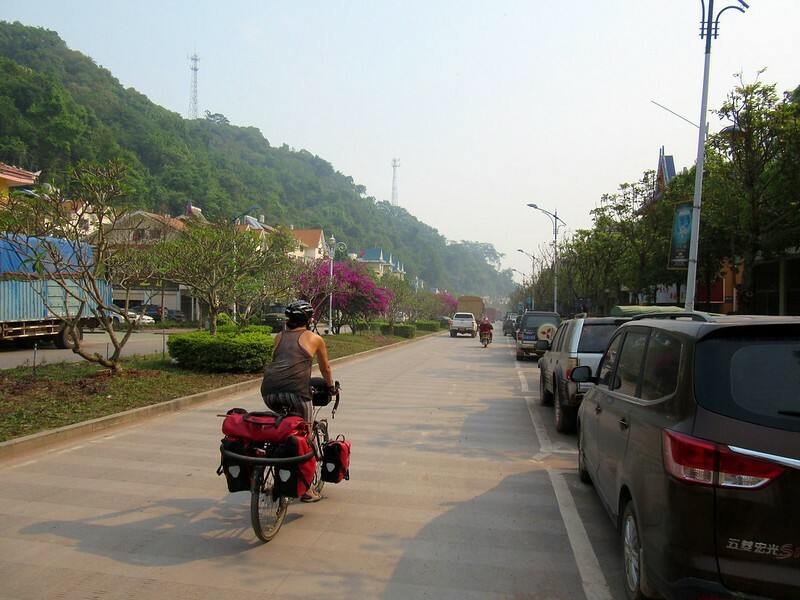 They are heading down through Laos into Thailand, then through Cambodia and finishing up in Ho Chi Minh. Typically, I’d thrown my maps of Thailand and Cambodia away just a couple of days previously. I’d been looking for someone to pass them on to, but hadn’t met anyone heading in that direction. We tried to tell them where we’re heading, but our pronounciation of Chinese city names must be terrible, as it took several repeats and pointing to our China map before they figured out where we meant! 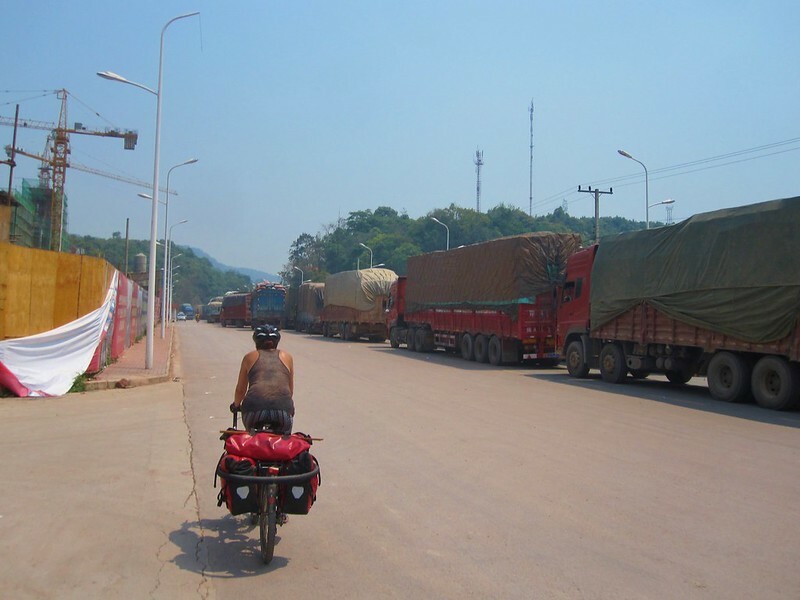 About 10km short of the border town, Boten, we came to a huge line of trucks, backed up from a checkpoint up ahead. We cycled up the outside of them, and were waved past the barrier. 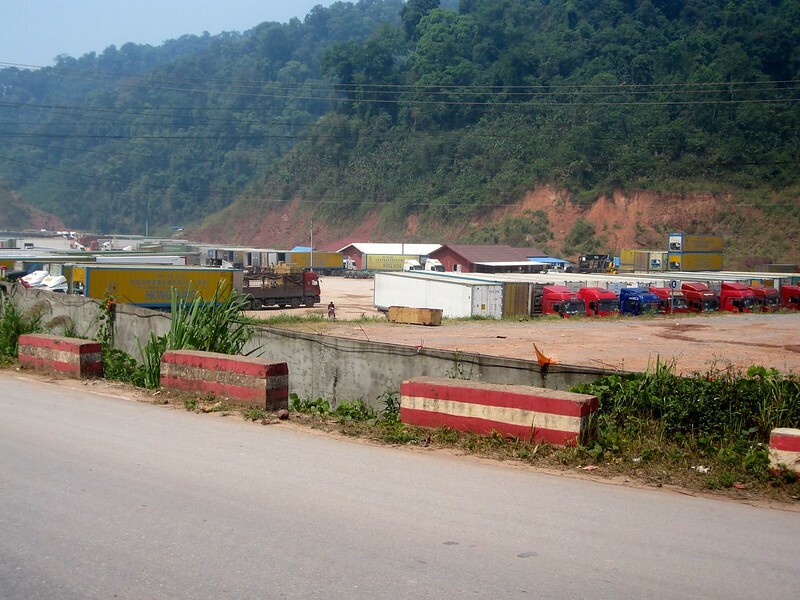 This was the checkpoint for entering the Boten Customs zone where hundreds of trucks were parked up waiting to have their loads inspected before crossing the border. 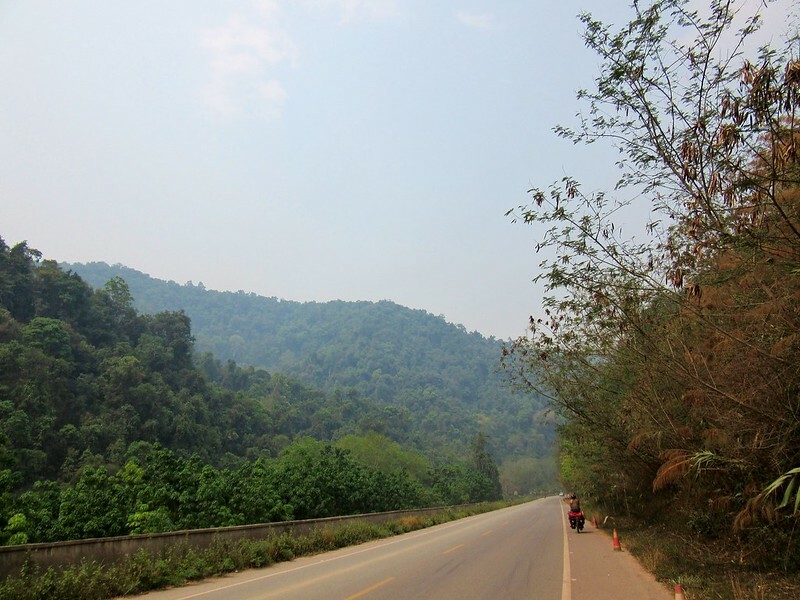 The remaining ride to Boten was quite unpleasant, very dusty and noisy with a constant stream of trucks passing us on a narrow road. We then reached yet another long tailback, this time for the border itself. Again we skirted up the outside of the queueing trucks then cut off the main road into Boten where we would stay the night, crossing the border first thing the next morning. Boten is a weird place. 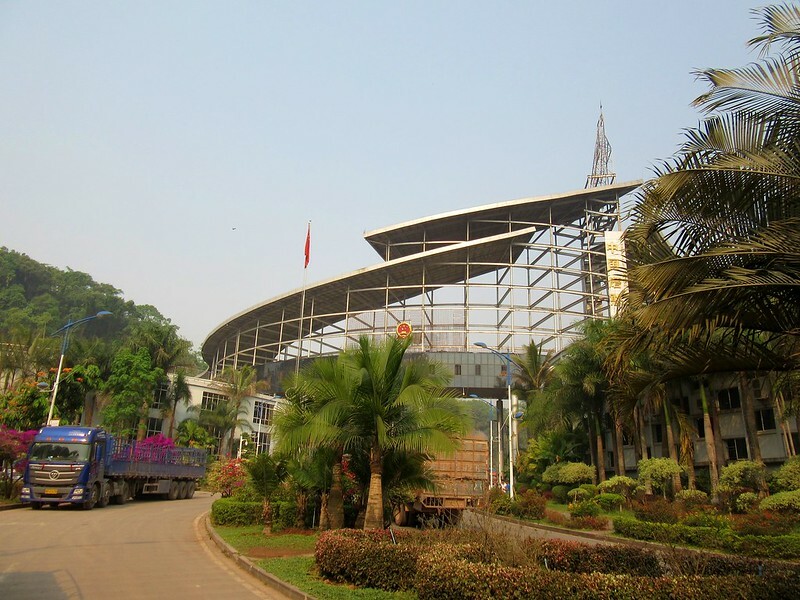 There are several huge casino hotels, built to attract Chinese gambling money. But they’re all empty and deserted, some of them not even finished. After some dodgy dealings and a number of ‘kidnappings’ when gamblers who couldn’t pay their debts were held, the Chinese government stepped up the pressure and had the casinos shut down. 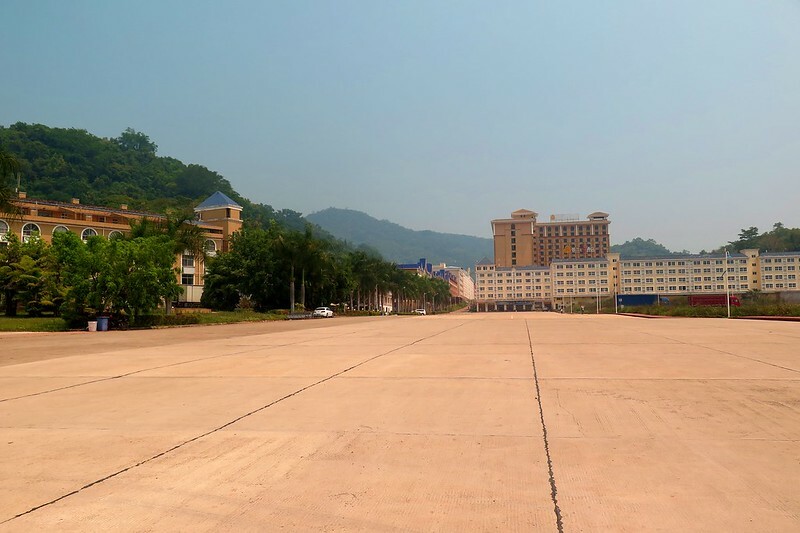 A few truckers hotels and restaurants remain, as well as a big duty free shopping centre, but other than that, it’s a bit of a ghost town. We went for a wander around the shopping centre, splashing out some of the last of our Kip on some Cadburys chocolate and a bottle of Chilean red wine. Then it was dinner in a Chinese restaurant and an early night. It already felt like we were in China, prices were all quoted in Yuan, all the signs and menus were in Chinese, and we even needed to use a VPN to access the internet in our hotel room. Luckily when we left the next morning, the line of trucks for the border crossing hadn’t had time to build up. We were at the Lao immigration point just after it opened at 8am and got our exit stamps after only a short wait. 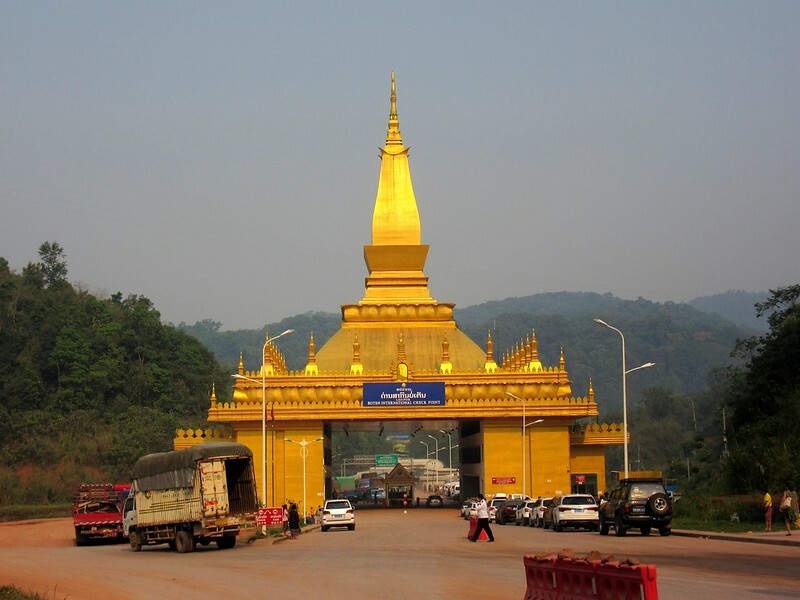 Back on the bikes we cycled through the bling gold archway that is the Lao checkpoint. 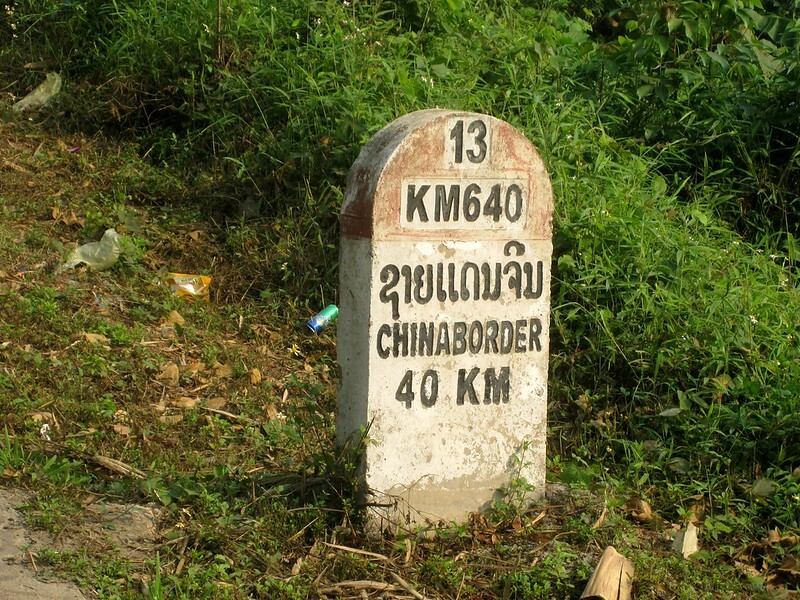 A few minutes through no mans land and we arrived at the big modern Chinese border point. We wheeled our bikes inside the building, leaving them leant against a wall while we had our passports checked and stamped. 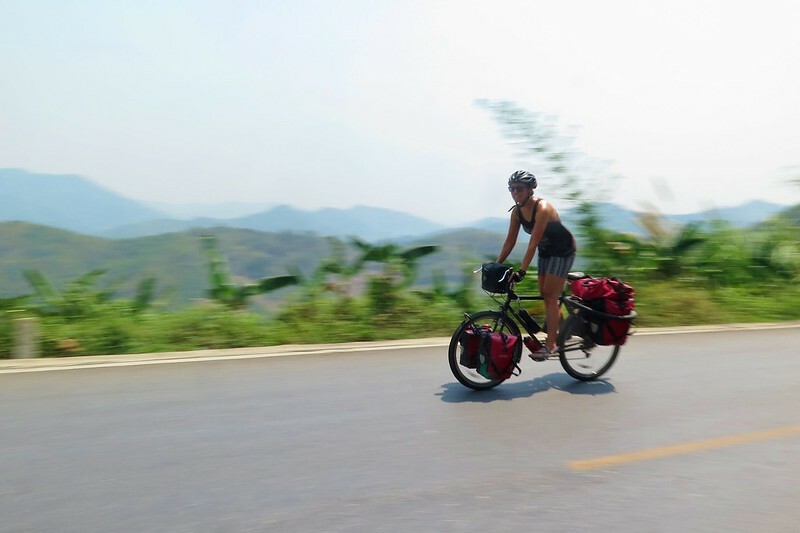 No need to check or xray our panniers as happened when we’ve entered China previously, so we headed back outside and rolled through the border. Into China for the third time. This side of the border was very busy and built up with rows of shops and hotels. 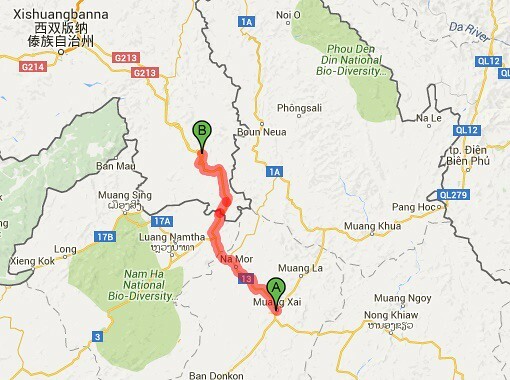 The road was wide and downhill so we coasted away following the new road all the way to the first major town, Mengla. Coming away from the border there were a lot of trucks passing us, and in places where the road is being widened, there was a lot of dust in the air. 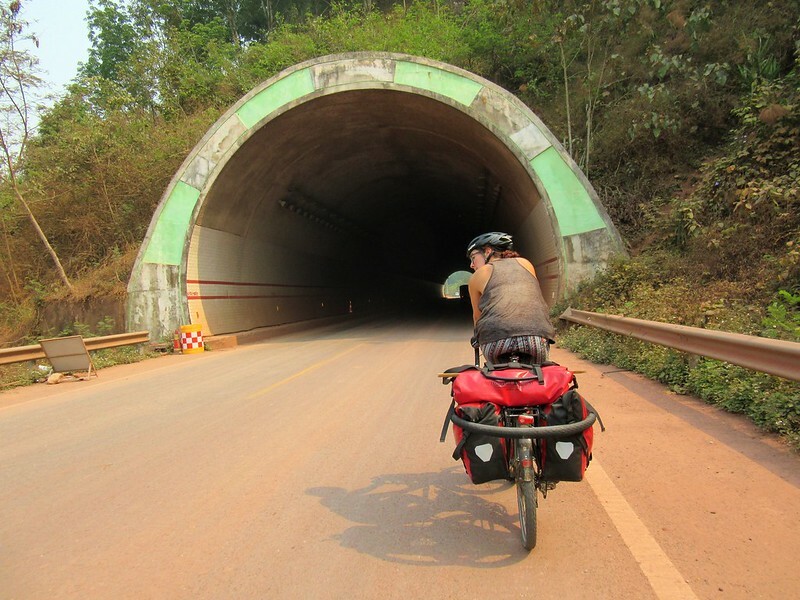 But in contrast to the roads in Laos, this one took us through tunnels and over bridges, smoothing out the mountains and making the 50km ride very easy. 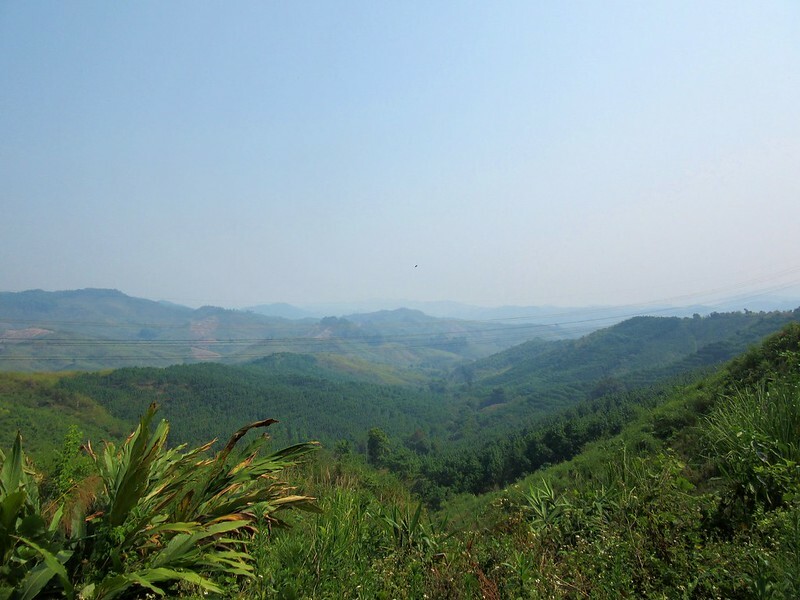 The scenery either side of the road was good too, the same lush green mountains and banana palms as were on the Lao side. 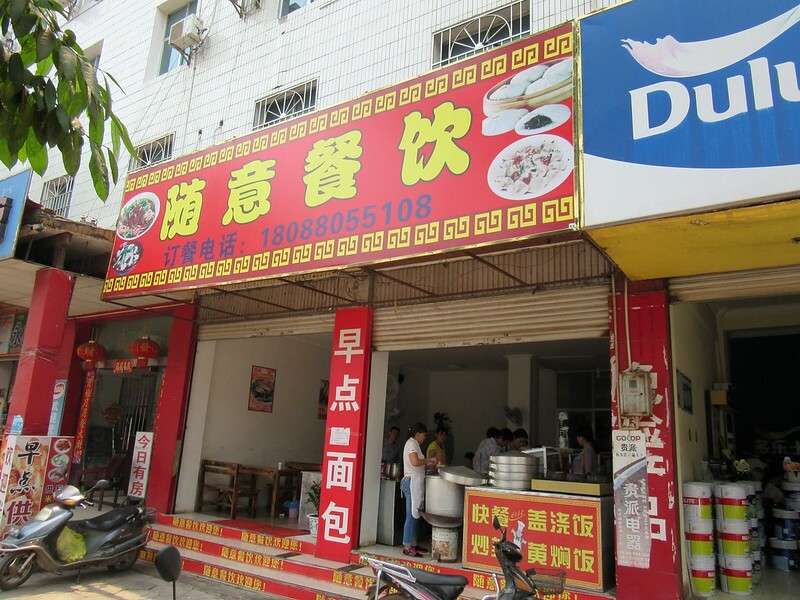 Coming into Mengla, we were straight into a restaurant for a few steamed buns and a bowl of noodles. The next mission was to find a Bank of China ATM as it’s the only bank that reliably accepts foreign cards. Bad news is that it looks like the Mengla branch closed a few years ago. Good news is that we’ve got enough Yuan left over from our last time in China so we’ll be ok for a good few days until we can get to a B of C in a bigger city.